Last night I suffered a terrible fate: Half-asleep, I sat on one of my new ebony needles. Yep. It snapped. I now have my Sockapaloooza socks on one ebony circ and one (shorter) Addi Natura. I’m not too fond of the Addi needle, but it was the only other 3mm circ I had. I have not yet decided if I will replace the ebony needle. I might not, because I do not use this size very often. Sigh. I’m interested in finding out more about your beehive heels. Where did you get the directions? Will you be able to share? Love the cables on the sock! I’m knitting the socks on the right, but you can see the heel better in the socks on the left. All of the socks in this booklet use the same heel. The gauge says vaguely: 11 rnds measure 1 inch, and it calls for 2.75mm needles. I’m using 3mm needles and they seem to be fitting my feet tolerably well. Allowing for the fact that I have skinny feet and my Sockapaloooza pal does not, I think they will be OK. The cables pull in quite a bit, so I hope that the ankles will not be too tight. (This might be why in the pattern these socks are anklets. I’ll post more about that when I get there!) The pattern calls for wool sock yarn. I am knitting in a lovely alpaca/silk/cashmere mix. It doesn’t have quite as much “give” as wool does, but it is sure soft! The socks are worked over 64 stitches. Across the instep there are four 6-stitch cables, each separated by 2 purls. I’m a two-circ knitter, rather than DPNs, so I started and ended the instep needle with 1 purl. The second purl for the outermost cables I worked by starting and ending the sole needle with 1 purl. In looking at the picture, that might not be quite what they had in mind. 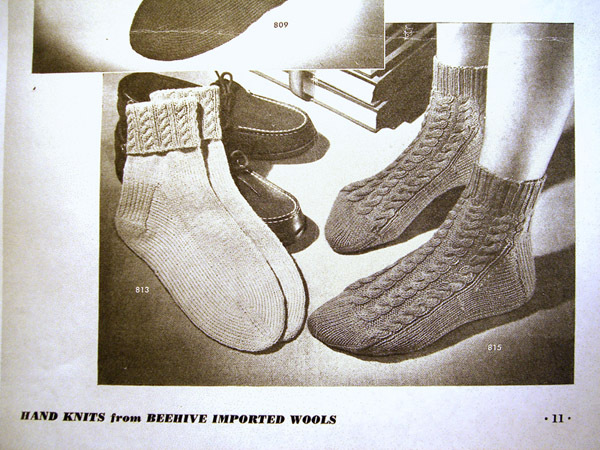 It looks like I should have worked the sole in straight knit. But I like the way it’s knitting up. I did find the heel in Nancy Bush’s Folk Socks. Somehow I knew that Nancy Bush would have the answer to this. I just looked in the wrong place first! She calls it a Half-Handkerchief Heel, and her instructions are fairly similar to what I’ve posted below from the Beehive pattern. HEEL . . . 1st row: Sl1, purl across. 2nd row: * Sl 1, k 1. Repeat from * across. Repeat the last 2 rows alternately until piece measures 2-1/4 inches, ending with a purl row. 1st row: K 18, k2 tog, k 1, turn. 2nd row: Sl 1, p 5, p 2 tog, p 1, Turn. 3nd row: Sl 1, k 6, k 2 tog, k 1, Turn. 4th row: Sl 1, p 7, p 2 tog, p 1, Turn. 5th row: Sl 1, k 8, k 2 tog, k 1, Turn. 6th row: Sl 1, p 9, p 2 tog, p 1, Turn. 7th row: Sl 1, k 10, k 2 tog, k 1, Turn. 8th row: Sl 1, p 11, p 2 tog, p 1, Turn. 9th row: Sl 1, k 12, k 2 tog, k 1, Turn. 10th row: Sl 1, p 13, p 2 tog, p 1, Turn. 11th row: Sl 1, k 14, k 2 tog, k 1, Turn. 12th row: Sl 1, p 15, p 2 tog, p 1, Turn. 13th row: Sl 1, k 16, k 2 tog, Turn. 14th row: Sl 1, p 16, p 2 tog, Turn. 15th row: Knit across (18 st. remain on heel needle). So the heel turns are short-rowed down, but then you just start working straight rows without short-rowing back up, if that makes sense. The decreases are all worked directly in the heel-flap stitches, and so make a line just under the heel flap. There is no diagonal heel-turn line at all. If you look at any of the other socks I’ve done, you can see this isn’t how I’m used to working heels. After turning the heel, the pattern instructs to pick up 16 stitches along each side of the heel flap, for a total of 50 sole-side stitches. The gussets are decreased until 32 stitches remain on the sole needles. Since I’m working this pattern toe-up, my plan is to increase until I have 50 working stitches on the sole needle. Since I start with 30 stitches (32 minus the two purls), this means 11 increases in each gusset, or 21 increase rows. This is quite a bit fewer gusset stitches than I normally increase. The other 5 heel-flap stitches on each side will come from the original 30 instep stitches. I’m going to turn the heel across 16 stitches (instead of 18) and work the heel flap over 30 stitches (rather than 32). This shouldn’t make a great deal of difference to the fit, and allows me to keep the two edge purl stitches on the sole needles out of the whole heel equation. I plan to work the heel turn by starting at row 15 and working backwards, doing increases instead of decreases until I have 30 heel stitches. Then I’ll start the heel flap. I will actually need one extra increase so that I have an odd number of stitches (31) to work the heel stitch pattern across. (It’s a standard Sl1, K1 pattern). I am planning on decreasing that extra stitch in the middle of the back when I start the first cable row at the back of the ankles. OK. That’s the plan, and probably more than you wanted to know! Stay tuned to see how well this works out. I’m knitting the gusset increases right now, and hope to have the heels turned tonight. I had to swatch this puppy twice before I got something that I liked the looks of. I asked Alice of Tangle Knitting Studio fame for her feedback on my swatch, and she liked the looks of it also. So, if this all works out, I will probably use this heel in the pattern I am doing for Tangle’s birthday. That pattern will be published here, as well as being available at Tangle (if you are in the Lake Oswego, OR, area), probably in June. If you torture data sufficiently, it will confess to almost anything.